Custom-crafted by a premier developer! Enormous 1100sf unit in an extra wide building with 2 bedrooms and 2 full and 1 half bathrooms. Blazing sunshine and flawless floor plan! 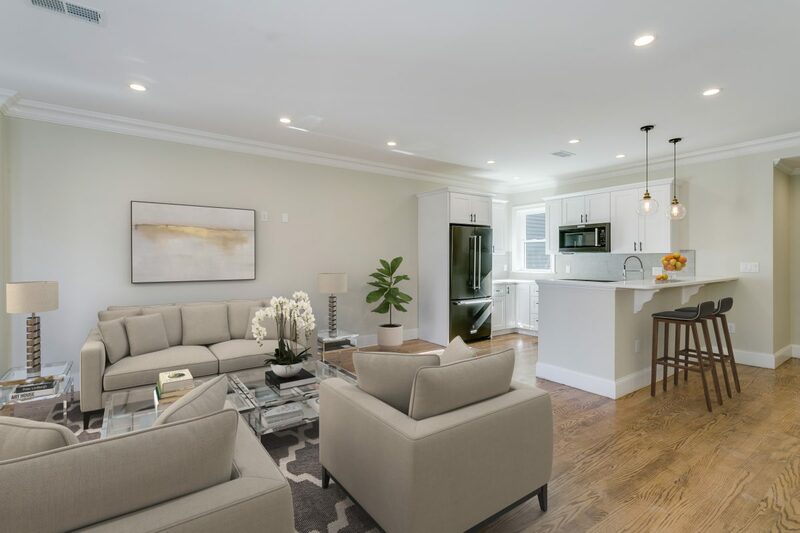 Sweeping, open living room and dining room, custom gourmet kitchen with state-of-the-art black stainless steel top-of-the-line appliances and white on white counters with a large breakfast bar and abundant custom cabinetry. Lavish master suite with multiple closets and a sumptuous spa bathroom with a Carrara marble vanity top, floors, and shower tiles. Very generous ensuite guest bedroom. Gleaming walnut-stained oak floors are everywhere! Come see this amazing home with a wonderful, entertainment-sized 10×16′ deck and huge private courtyard with skyline views. Every amenity you desire and more! Central air, in-unit laundry, and direct access to private 300sf heated storage room. An outstanding offering!